A hospital near Taizhou in Zhejiang is "crying poor" saying that increasing patient burden and rising prices means it does not have enough money to buy essential drugs. The Xianju county hospital has out up a notice on its public LED screen asking for "understanding" because it is no longer able to provide medical supplies such as blood plasma. The hospital authorities said their outlays exceeded their income and they no longer had funds to buy drugs and other medical supplies. 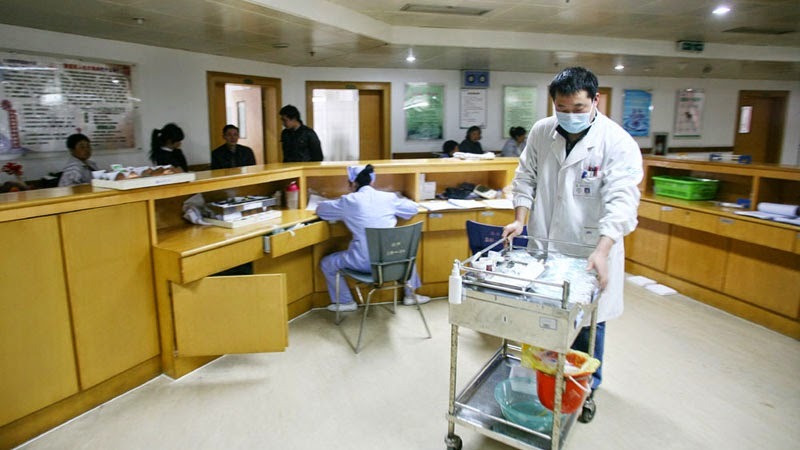 The director of the hospital, Chen Xiaojun, told Xinhua that the hospital was more than 15 million yuan in debt because the New Rural Medical Insurance Scheme did not cover all the expenses incurred by patients and the insurer was refusing to release further funds. The local health department was also refusing to provide further funding, and the unpaid bills of 11 million yuan meant that pharmaceutical companies were no longer willing to supply drugs to the hospital. The shortage of drugs was most acute for the high cost drugs for conditions such as bronchitis and anaesthetics and other drugs needed to cover surgery, he said. This meant that operations at the hospital also had to be curtailed. Medical staff said patients were being advised to find another hospital if they had a serious disease, and medical staff were also complaining that their wages had not been paid for some months. The hospital authorities blamed the 'bankruptcy' on three factors: they said the government reimbursement levels for had been set in 2008 and had not kept up with rising costs or increasing patient numbers. Secondly, the price of drugs had also increased substantially, leaving hospitals out of pockets, especially with new zero markup policies. And most importantly, the rural medical insurance scheme expanded the reimbursement to patients for inpatient costs from 40% to 80% of fees, which meant many patients now wanted to stay as inpatients for longer, driving up costs. A spokesman for the Xianju country government said the relevant departments were now having a 'crisis meeting' to solve the problems that had led to the lack of funding at the hotel. However a spokesman said the Xianju hospital was not the only hospital facing the problems of rising costs and falling income, and the problem had to be tackled on a wider basis by changing the reimbursement system and charges, he said. The local government also criticised the hospital for making public announcements about its poor financial state and lack of medications, as this would lead to public panic and loss of faith, he said.